Ukraine has existed in Central/Eastern Europe in some form since the 9th century. Following the disintegration of the first Kyivan Rus’ state, Ukraine was within the Kingdom of Galicia (Halychyna) and Volhynia in the 13th-14th centuries, and was subsequently subsumed into the Lithuanian state. A period of Polish rule was followed by the formation of a self-governing Cossack republic (Zaporizhian Sich), prior to division between the Russian and Austro-Hungarian Empires. Following WWI, imperial fragmentation and a nationalist movement led to short-lived independence as the Ukrainian National Republic (1918-21). Following the Ukrainian-Russian war and foreign military intervention, Ukraine, weakened and internationally isolated, fell under Bolshevik control, becoming part of the USSR. During the Soviet era, Ukrainians suffered from the Holodomor, Stalin’s artificial famine genocide which killed around ten million, mass deportations, murders of nationalist intellectuals, and millions in casualties in WWII. Following the USSR’s dissolution, Ukraine proclaimed independence on August 24, 1991, in its capital Kyiv. Ukraine today covers 603,628 sq. km. and comprises 24 provinces and the Autonomous Republic of Crimea. 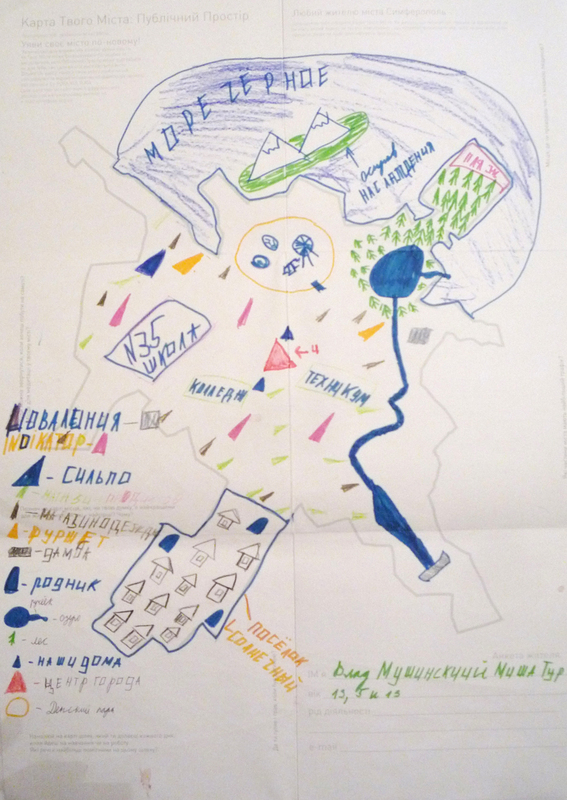 Notes: A Chicago expat living in Ukraine, Roman Petruniak, proposed to develop a “Peoples Atlas of Public Space” in 5 different Ukrainian Cities (Uzhgorod, Donetsk, Kherson, Simferopol, Vinnytsia) as part of the the Garage Gang Kollektiv’s year-long “Celebration Generation” project. The Celebration Generation project officially began in October 2010 when members of the Garage Gang Kollektiv embarked upon a five week tour throughout Ukraine in their mobile communications lab called the “Fura Kultura”. The purpose of the tour was to investigate how Ukrainian citizens perceive the concept of public space and the concept of the “Right to the City” and was partially inspired by the NPA project in Chisinau, Moldova conducted earlier that year.Blank maps of each city were distributed in each city visited on tour. In the end, over 300 hand-drawn maps were collected during the course of the tour. Afterwards, with the help of local partner organizations from each city, members of Garage Gang Kollektive analyzed and aggregated the map data into a set of Google maps. These have since been forwarded to a graphic designer who is currently in the process of generating a series of info-graphics for each city. Additionally, while in each city, the Garage Gang team utilized “grassroots mapping” technology (as pioneered by the folks at the Center for Future Civic Media at MIT) to make aerial photographs of the many interesting public spaces being referenced in the people’s hand drawn maps.